Have you ever been on a long-awaited vacation only to have a family member get sick? I have had that happen more than once, and you really feel like you are in a quandary. Up until now, the options were not great. Go to the emergency room or walk-in clinic or forget about your vacation and head home to see your doctor. Now, thanks to technology and Amwell, the nation’s largest telehealth company, we have a much better option. Amwell has a convenient app and website where can you consult a doctor, therapist or nutritionist immediately, from home or on-the-go. Licensed doctors can diagnose, treat and prescribe medication all by video. After your online visit, you will get a complete write up of what the doctor recommends. If your condition calls for a prescription, the doctor can call it in to a convenient pharmacy, both home and away. A few years ago, I got food poisoning while on vacation and I was too sick to leave the room. I didn’t know if I caught a stomach bug, a virus, or really what was going on.We had to extend our stay and let my condition play out, but it would have been wonderful to be able to speak with a board-certified physician to diagnose the problem and recommend a remedy. Even when you are at home, often you cannot get in to see a doctor soon enough. When a loved one gets sick, it can cause a lot of stress and worry. When only one kid is sick and you have to pack up and drag everyone into the doctor’s waiting room which is full of sick people. Can you think of other circumstances where having Amwell available to you 24/7, would make life a little easier? Anytime you need an appointment, Amwell is available to you. All doctors are licensed to practice and prescribe in your state with 10+ years of experience. 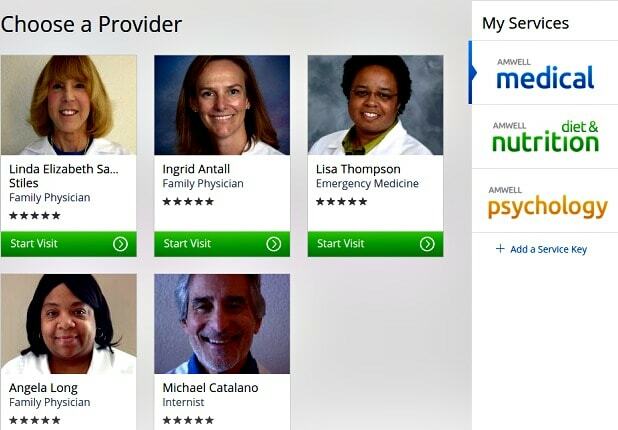 You can also have an online appointment with a nutritionist, dietitian, psychologist, therapist or social worker. Using Amwell is very cost-effective at just $49 a visit which is often cheaper than a trip to your local urgent care and emergency room. I am very excited to offer my readers at More With Less Today a coupon code to try the service for free. Sign up and enter promo code MOMSQUAD and your first “visit” is covered. You can sign up on their easy-to-use website or by mobile phone (Android or iOS) app, and be connected to a licensed practitioner in under two minutes. I was ready to give it a Amwell a try. My husband had been encouraging me to see a doctor about a personal (female-type) reoccurring issue. This time, the tables were turned and I was the one who did not want to take the time to go to the appointment. Plus, my issue is kind of embarrassing and it’s easier for me to talk about via computer rather than in person. I entered in my basic information. The website is secure and saves the information so you don’t have to keep re-entering with every visit. I was able to choose which doctors were available to me right now based on my location in California. I was chatting with the doctor by webcam in no time. She was very knowledgeable, and made me feel comfortable right away. We spoke about my condition and history for about 20 minutes and she gave me a few ideas to try and invited me to get back in contact with her for a follow up. Wow! It was almost too easy. 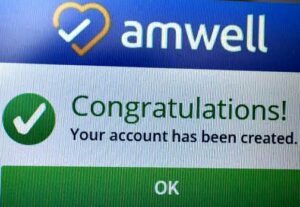 I highly recommend giving Amwell a try. Be sure and share the information with your friends and family and refer them to this blog post so they can also take advantage of the free first visit. If you do end up needing to make an office appointment, you can look for a doctor in your city with the Amwell find a doctor page. If you or your loved ones are having any heart attack symptoms or signs of stroke, of course, call 911 and go immediately to the ER. Watch this short You Tube video and see if this experience sounds familiar! I have been in this situation many times and I’m so glad to be able to offer you Amwell as an alternative. With Amwell, the doctor will see you now! You will see why #MOMSLOVEAMWELL. Compensation was provided by Amwell via Mom Trends. The opinions expressed herein are those of the author and are not indicative of the opinions of Amwell or Momtrends.